So…Just How Tough are Microsoft’s Surface Tablets? We’ve recently seen the official retail prices of the upcoming Surface tablets by Microsofts, which is set to be one of the more interesting pieces of tech hardware this year. Of course, whether it will be a success hinges greatly on whether Windows 8 (which, even until today, Microsoft has not given anyone a proper look at) manages to be as highly capable an OS as its predecessors. Oh, and of course, product durability. This being Microsoft’s first foray into making hardware, perhaps they needed to show just how durable the Surface tablets can be. 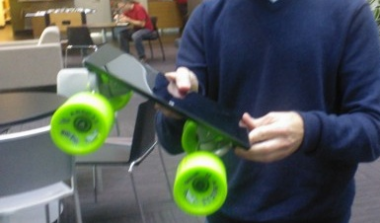 And what better way, in Microsoft’s eyes, than to demonstrate it by DIY-ing the tablet into a skateboard? Because, you know, a skateboard is hip, it’s fun, all the cool people have one. 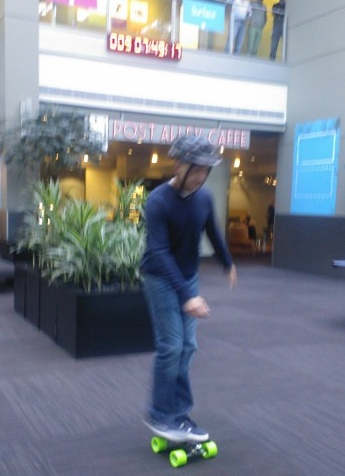 Steven Sinofsky, the Windows unit president himself took it out for a spin at the lobby of one of Microsoft’s studios in its campus, and tweeted photos of him riding the Surface tabskate (that’s one word amalgamation that will never catch on) around the lobby.